In her sophomore smash hit, Sofia Coppola introduces us to a familiar world within the realms of loneliness and isolation. Lost in Translation revolves around Bob Harris (Bill Murray) who’s experiencing a mid-life crisis in Tokyo while filming a commercial advertising a whiskey for $2 million when he “could be doing a play”. Bob encounters philosophy college graduate Charlotte (Scarlett Johansson) who’s undergoing her own psychological breakdown while her fashion photographer husband is noticeably absent while working on location. Bob and Charlotte are two people at opposite ends of life with a comparable connection, and the two form one of the most unique bonds between two individuals struggling with various components of being lost. While Charlotte is grappling with the 20s crisis of ‘what am I doing with my life?’, Bob is struggling with the same complex issues from an older perspective. The two share a rare camaraderie that is seldom accomplished well on screen without feeling complicated, unnatural or creepy. 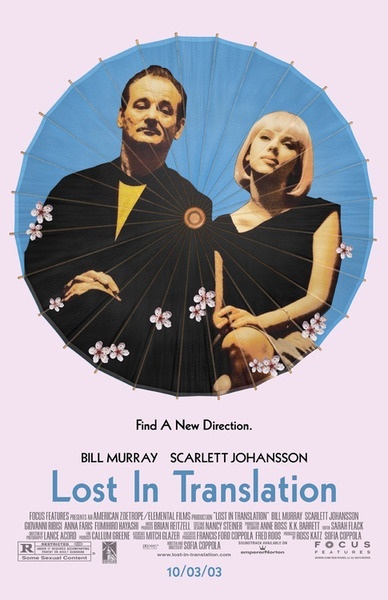 Lost in Translation received critical acclaim in 2003 and was nominated for four Academy Awards, including Best Picture, Best Actor for Bill Murray, and Best Director for Sofia Coppola; Coppola won for Best Original Screenplay. Bill Murray and Scarlett Johansson each won a BAFTA award for Best Actor in a Leading Role and Best Actress in a Leading Role respectively. The film was also a commercial success, grossing $119 million from a budget of only $4 million. This is a film I explored early in college, and I couldn’t get into it. I consider this a blind spot movie for me, because I re-watched it for the first time in a decade and fell completely in love with the characters, ambiance, cinematography and storyline. It’s a story and message that transcends time and resonates greatly with anyone who’s ever felt alone or isolated, which is something I’ve struggled with significantly in my late 20s like Charlotte. One of my favorite aspects of the film is the cinematography and the fine work of director of photography Lance Acord. There are many shots in shadows and dimly lit locations that visually represent and convey isolation. Tokyo is constantly lit and booming with color, while the main characters are more concealed in the shadows symbolizing their loneliness and detachment from the outside world. Under the cut are some of my favorite stills from the movie. What are your favorite shots from Lost in Translation? My favorite shot of the film is where Charlotte looks out the window of Tokyo as Squarepusher is playing in the background. It literally took my breath away as it’s among the reason why I love this film more than anything. Here’s 10 Reasons why I think it’s the best film ever. UGH! This is such a beautiful post. One of my all time favorite films, ever, and the cinematography is so richly entrancing and so full of life and subtext. Thanks, Andrew 🙂 Glad you liked it! Yesssss! Thanks for commenting, Chris! I’ll have to re-watch Somewhere again, because I was bored to tears when I first saw it! I think my favorite scene was at the end. “I’ll miss you.” It was such a unique relationship. It wasn’t romantic, but it wasn’t necessarily unromantic. I don’t really know how to fully describe it. What a lovely post! I love the visuals here and the movie resonated with me, the tentative romance, the humor, everything. Bill Murray is simply outstanding and it was the first time I saw Scarlett and was very impressed! I love the gifs you made. I dunno how many times I’ve watched this movie, there’s something so special about it… the soundtrack was very special too. Did you know that it was Coppola who took out Kevin Shields of My Bloody Valentine from his reclusion so he actually started to work again? Thanks for sharing your own personal story on how you approached the film.